Philemon Limo, 25, has only been running seriously for two years, and racing at world class for 12 months writes Pat Butcher. But he ran away from three men who have already gone under the hour for the half marathon. He beat Azmeraw Bekele of Ethiopia and Titus Masai by over a minute, taking 37 seconds off the course record, to become the third fastest man of the year at the distance. Lydia Cheromei took exactly a minute and half from the former record, and is the second fastest time of the year. Azmeraw was a marginal race favourite and followed pacemaker Edward Muge in the early stages along with Masai and Jairus Chanchima. But Limo was lurking in the background, and stayed with the favourites when a group of five broke away after 5km. At halfway the group was down to Azmeraw, Masai and Limo, but 2km later Limo shot away to built up a lead which just grew and grew. It is just over 20 years since Cheromei shocked the athletics world by taking the world junior cross country title a month or so short of her 14th birthday. Following the birth of daughter Faith, now five, she has returned as a marathon runner, with a best of 2:23 in Dubai in January. She now has an equally good 'half' to her name after running away from Belainesh Zemedkun of Ethiopia, and course record holer Rose Kosgei. In warm weather and a slight wind, two 18-year old Kenyans stole the show. Junior World Cross Champion Geoffrey Kipsang won the men's race while Valentine Kipketer was a surprise women's winner after pre-race favourite Sabrina Mockenhaupt dropped out at 12km. 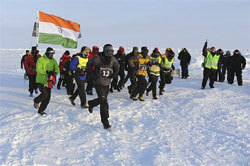 A record 25,500 runners from 102 countries were entered in this 31st edition of the race. Kipsang went through 10km in 28:47 in the lead group, and only drew away from the others after 17km. Kipketer led from the start in the women's race, the first she had run outside Africa,and only her second half marathon. She led through 10km in 32:33, with Mockenhaupt running behind her but still on course for a personal best up until the time she dropped out. Kipketer subsequently slowed, but her win was never in doubt. 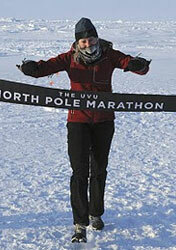 The marathon started at 22:00 and ran throughout the 'night' (there are 24 hours of daylight at the North Pole). 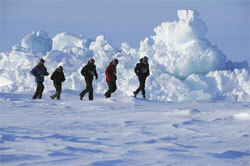 The temperature was -32°C and conditions underfoot became more difficult as the race progressed. 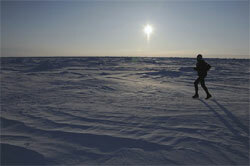 However, all runners successfully completed the event and have now stood at the precise Geographic North Pole. A total of 20,000 participants took part in the various race distances, including 1147 in the Marathon, 6000 in the Half Marathon and 10,000 in the 10km. The 4.2km course, offering just a taste of the Tel Aviv Marathon experience attracted 3000 more runners. It was the largest ever-running event in Israel, indicating the unprecedented growth of running in the country since the renewal of the Tel Aviv Marathon tradition in 2009. The pleasant weather (12°C at the start) and the spectacular flat courses, contributed to the many personal records achieved. 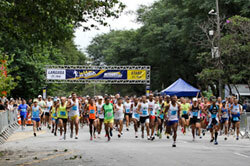 Participants ran along the main streets and avenues of the city, the splendid seashore and the spacious parks. The leading groups in both men's and women's marathons were dominated by Kenyan and Ethiopian runners. Running in unseasonably warm conditions Solomon Bushendich won the 11th edition of the Milano City Marathon a minute ahead of Ruggero Pertile writes Diego Sampaolo. The 27°C heat took a dramatic toll in the women's race as Marcella Mancini overtook Monica Wangari as she struggled along at 5 minutes per kilometre pace in the final stages. Kenyan pacemaker Nickson Kurgat and Gilbert Chepkwony set the early pace passing five kilometres in 15:01 and the 10km in 30:37 leading over a group which featured Daniel Limo, Daniel Too, Joel Kimurer Kemboi, Bushendich and Pertile. Pacemaker Gilbert Chepkwony led through halfway in 1:04:50 and finished his duties at 30km (1:32:35), leaving Bushendich, Pertile, Daniel Too and Daniel Limo at the front. 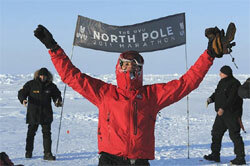 Bushendich broke away with a 33rd kilometre clocked at 2:56 and continued to increase his lead. In the fight for second place Too tried to pull away from Pertile at 38km but the Italian responded, and went ahead at 40km. "The conditions were difficult" said Pertile, "but running on a warm day was a good test for the World Championships in Daegu". Wangari led the women's race by over two minutes at halfway (1:14:21 to 1:16:45), and extended it to over three minutes at 30km (1:47:13 to 1:51:25) but began to fade after 34km, running 5:20 for the 39th kilometre. Mancini closed the gap and took the lead with 2km to go. While the conditions did not allow for fast times, the sunny weather was the backdrop to a marvellous running day for a record figure of 10,203 runners who took part in the two main events: 5075 in the Marathon and 5128 in the second edition of the Relay Marathon. Kenya prevailed at thew 35th Paris Marathon, with victories in both men's and women's races, writes Pierre-Jean Vazel. After a fast start a pack of about 15 men including the pacemakers reached 10km in 29:46, and 15km in 44:55. At halfway (1:02:39) pacemaker John Komen injected pace, but the group did not respond. Komen dropped out at 30km (1:29:28) to leave Henry Sugut in front of a group of eight. At 35km (1:45:03) Alfred Kering caught the leaders just at the point when Benjamin Kiptoo accelerated, dropping Bernard Kipyego and Eshetu Wendimu. At 2:54/km pace, he was now unstoppable. Kiptoo smashed his personal best and ran the fourth fastest time ever in Paris. Despite the heat (20°C) eight men ran under 2:09. In the women's race the favourite Mamitu Daska, Koren Yal (a 2:24:33 performer), Ashu Kasim (4th in Paris in 2009 with 2:25:49) and Marathon debutante Mestawet Tufa took command. They maintained their lead through 10km (32:59) but Agnes Kiprop, fastest in the field with 2:24:07, surged to the front at 15km (50:14). At halfway (1:10:27), Daska dropped back as the sun and heat rose over the French capital. Then Priscah Jeptoo gently but surely got rid of Kiprop along the banks of the Seine, and entered the Bois de Boulogne (30km in 1:41:54) with a winning margin. She improved her previous best (2:27:01) by more than four minutes, running the second fastest ever time in Paris, 51 seconds down on the course record. Running in sunny and humid conditions Wilson Chebet broke away from Vincent Kipruto the final stages to win with a world leading time writes Wim Van Hemert. 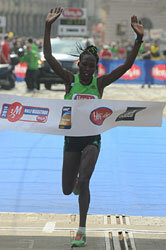 Philes Ongori won her debut marathon by beating Hilda Kibet. Hopes for a new World mark in the men's race lasted until 25km. Six pacemakers went through 5km in 14:38 and then speeded up, passing 10km in 29:09 and 20km in 58:40. But then the pace began to slip away from world record schedule. Sammy Kiwara led through 35km in 1:43:44 before finishing his duties, leaving Vincent Kipruto and Wilson Chebet out on their own. They passed 40km in 1:58:47, and Chebet opened a gap at 41km. In the womens' race, Hilda Kibet led from the gun, heading a lead group of four with Ongori, Lishan Dula and Shetaye Bedasa as far as 30km, reached in 1:43:17. Dula and Bedasa then dropped back, leaving Ongori to make her move in the final kilometre. Despite warm conditions both winners set new course records writes Mirko Javala. Good weather made it possible to really test the World Championships marathon course and it proved to be fast too. The men's race started fast pace but a huge lead pack of 21 athletes (containing 12 Kenyans and five Ethiopians but only one Korean) reached 5km in 15:04. The next 5km was faster with the trio of Daniel Abera (ETH) and Kenyans Hillary Kimaiyo and Boniface Muema leading through 10km in 30:01, still with 18 athletes left. The same number were still there at 20km, with a 60:38 split. Then things began to thin out, with 13 in the group at 25km and 11 at 30km (1:30:47) with more dropping off soon after, even though the 5km split to 35km was slower (1:46:20). Six were left to fight it out. Songoka made his move and by 40km held a clear lead with Abdellah Falil eight seconds behind. The top six were all under 2:10. The women's race had fewer elites and the lead pack was more compact. 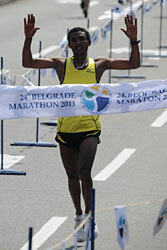 Atsede Habtamu led through 5km in 16:59 and 10km mark in 34:04 with eight runners together, including five Ethiopians. The others — two Kenyans and Wang Xiaoshu of China were dropped in the next 5km and the Ethiopian quintet passed through 15km in 50:52, 20km in 1:08:07, 25km in 1:25:46 and 1:43:12 for 30km. At 35km there were still four together but the end game then started. Habtamu sprinted off the remaining group at 40km passing through in 2:18:25, two seconds ahead of Yeshi Esayias as the others dropped back. Habtamu went on to set a new course record and last year's winner Esayias finished behind her in a time three minutes faster than the personal best she set in this race last year. High winds blew away any chance of fast times but Gebrselassie Tsegaye, 27, was always in the men's leading group writes Pat Butcher. He said afterwards that he was uncomfortable at 30km, when he conceded the lead to Michael Rutto, but he came back and pulled away from his pursuers only a short while later to win by a four minute margin. By contrast, Frasiah Waithaka only pulled away in the final stages of the women's race and, despite the conditions, clocked a personal best time. Local hero Olivera Jevtic failed to score an eighth victory in the half marathon. She could only finish third. 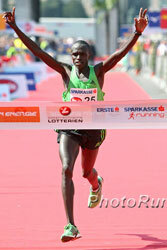 John Kiprotich (Kenya) and Fate Tola (Ethiopia) were the unexpected winners of the 28th Vienna City Marathon. 22 year-old John Kiprotich improved his personal best by more than seven minutes. At halfway the pacemakers led through in 1:03:53, but were reluctantly followed by the main contenders who were more concerned with watching each other. By 30km (1:31:31) the course record was beyond reach. By 35km the lead group was reduced to four Kenyans: Patrick Ivuti, Evans Kiplagat, Joseph Maregu and John Kiprotich. Maregu and Kiplagat soon dropped back and it was then John Kiprotich who applied pressure on Patrick Ivuti. At 38km he opened a winning gap. The women's race was completely different with debutante Peninah Arusei running fast from the start. She was soon on her own, reaching halfway in 1:12:11. At 25k she was 1:14 minutes ahead of Ana Dulce Felix, Fate Tola and Genet Getaneh (Ethiopia), but by 30km her advantage had started melting quickly in the sun. While Getaneh also slowed Felix, who had her own pacemaker in front of her, and Tola overtook Arusei at around 37km. There was a tough fight for victory between Tola and Felix but with 1km to go Tola broke away. 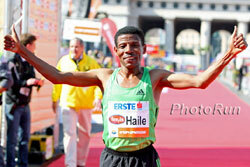 In the Half Marathon Gebrselassie had started two minutes behind the leaders of the Marathon, but caught and passed them by 12km. More than 300,000 spectators lined the streets. Many had come to see the great Ethiopian running through their city. Fitting to the occasion organisers had put down a red carpet on the final 100 metres of the race, which finished at the Wiener Hofburg. Among all events there were 32,542 entries, with 8044 in the Marathon. Daniel Kiptum, in fourth, beat his world record for deaf runners with a time of 2:11:32 and 77-year-old Wesley Love (USA) reached the finish line of his 200th and final Marathon with a time of 6:03:36. Participation in the relay marathon doubled. Of the 3,900 registered marathon runners, 3,321 started and 3,175 finished. In the relay 2,652 participants entered, 2,592 started, and 2,572 (643 teams) made it to the finish line. 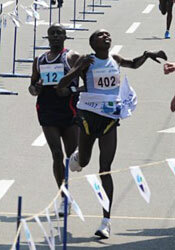 John Kyui broke away at 30km and dominated all the way through the finish line. Aleksey V. Solokov led the chase group, securing second place. 27-year old Kyui beat his best time by five minutes. Kiptum improved his world record among deaf runners by about two and a half minutes. A strong duo led the women through the first half of the race but at 35km Svitlana Stanko pushed ahead of Switzerland's Patricia Morceli and Kenya's Salome Biwott. 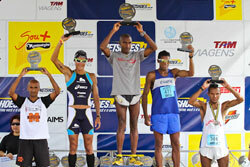 Kenya's Moses Arusei beat defending champion Thomson Cherogony to set a new course record writes Emeterio Valiente. Ethiopia's Desta Girma Tadesse defended her title in a modest 2:35:28, two seconds faster than Gebriel Teamu, who was making her marathon debut. Passing through 10km in 30:35 a large group of Africans was already on pace for a new course record in the men's race. No less than 12 remained at halfway 1:04:35. After pacing had finished Arusei's front running soon paid off and only three runners were able to keep up, passing through 35km in 1:47:07: Cherogony, Francis Kiprop and Ethiopia's Gamal Belal Salem. With 2km left Arusei opened up a 20m gap on an uphill section and there was no catching him as he romped home to dip under 2:11 for the first time in Madrid. Arusei commented: "The first half of the race was comfortable but the second part is full of ups and downs and the hilly closing 5km make this marathon really tough. I liked how the people cheered me on throughout." Ethiopians swept the women's race. Reaching halfway in a modest 1:15:32, five women were in contention: Girma Tadesse, Teamu, Shuru Diriba, and Worknesh Tola with Hellen Kimutai the only Kenyan. The pace slowed in the second half, but Kimutai lost contact at 35km (2:07:36). With 1km to go the four Ethiopians remained together until Girma Tadesse's late burst of speed stretched the others out. Strong south-westerly winds coupled with cool temperatures provided a magic carpet ride for athletes competing in the 115th edition of the Boston Marathon writes David Monti. The outcome was the two fastest Marathons ever run. Close finishes in both the men's and women's contests heightened the excitement surrounding America's oldest marathon. Kenyan Geoffrey Mutai had fans screaming on Boyleston Street as he won a two-man sprint by four seconds over Marathon debutant and compatriot Moses Mosop in the unlikely time of 2:03:02, fully 57 seconds under Haile Gebrselassie's World record of 2:03:59. But there is no new World record; even without the tail wind the Boston course has more than three times the elevation drop permitted for record-setting. "It was at our back," Mutai said matter of factly about the wind. Mutai credited American Ryan Hall for his fast performance today as he had reinvigorated the pace nearly every time the race slowed on the hilly course from Hopkinton to Boston. Hall saw the lead pack through 10km in 29:05. "I want to congratulate him," said Mutai. "He pushed it, he pushed it all the time. He was like a pacemaker; he helped us a lot." Halfway was reached in 1:01:58, but the pace quickened in the second half, despite several challenging hills. Mutai broke away by blasting 30-40km in 28:22. Only Mosop had the legs to follow him. Mutai ran the second half in 1:01:04. Not since Lisa Larsen-Weidenbach crossed the finish line first 26 years ago has an American woman won the Boston Marathon but Desiree Davila came very close. New Zealander Kim Smith led for 29km at a fast pace but suffered spasms in her calf muscles so severe that she began to skip and hop up and down and by 30km was swallowed up by a chase pack of four women: Kenya's Sharon Cherop, Caroline Kilel and Alice Timbilili, and Ethiopia's Dire Tune. Davila was about 20m back. Smith abandoned but Davila moved up and took over the lead. First Timbilili then Tune fell back, leaving Davila, Cherop and Kilel in contention for the win. A surge by Kilel dropped the tiring Cherop and Davila was hurting. The two traded surges, and the crowd roared for Davila. But Kilel made the final move with 200m to go, and Davila could not respond. Cherop came in four seconds later. There were 26,964 entrants and 24,385 starters.